Book the freshest pick of our deal hunters now and fly from New York City to Hyannis under $100 r/t. This super cheap flights is operated by Jetblue Airways and costs $98 r/t including taxes. Act fast, airline tickets at such rates will sell out really fast! You can book this Hyannis flight both at Expedia and Cheapoair, but our deal hunters have found it while browsing on Travelgrove. In any case, it is always wiser to check as many merchants as one can to find the best flight deal. This shorthaul flight starts out from John F. Kennedy International Airport (JFK) on July 10 and comes back from Barnstable Municipal Airport (HYA) on July 14. The flight is non stop each way and is only a few minutes longer than one hour. For booking this airfare, JetBlue TrueBlue, the airline’s frequent flyer program will provide you with 294 award points. It is not much, but adding up it can help you gain a free airfare! 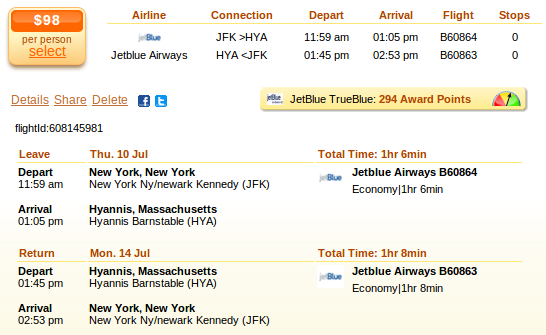 Jetblue’s offer is super cheap compared to the other airlines flying on this route, only $98 r/t. The next best offer is a flight jointly operated by JetBlue and Cape Air, for $200 r/t, more than two times the price of the JetBlue-only deal. This entry was posted on Thursday, May 29th, 2014 at 7:31 am and is filed under Airfare Deals. You can follow any responses to this entry through the RSS 2.0 feed. You can leave a response, or trackback from your own site.